About 1 in 3 adults of 50 years suffer from sarcopenia, a progressive loss of muscle mass and strength, which can affect a person's energy and ability to perform daily activities. Christopher Adams, a researcher at the University of Iowa (Iowa, USA), and colleagues explored the cause of age-related muscle weakness and atrophy, discovered the first example of a protein that causes muscle weakness during aging. The protein, ATF4, is a transcription factor that alters gene expression in skeletal muscle, causing reduction in muscle protein synthesis, strength and mass. 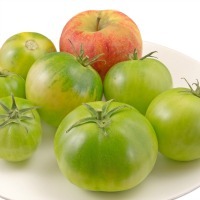 The researchers also identified two natural compounds of ursolic acid and tomatidine - found in apples and green tomatoes, respectively - that reduce the activity ATF4 in skeletal muscle aging. The team analyzed mice elderly with muscle weakness and atrophy due to aging, feeding them with a free diet or one containing 0.27 percent of ursolic acid, or 0.05 percent tomatidine, for two months. The scientists found that both compounds through increased muscle mass by 10%, and more importantly, the quality muscle, and the strength of 30%. Writing that: "These results clarify ATF4 as mediator of age-related muscle weakness and atrophy," the authors of the study argue that "these findings identify ursolic acid and tomatidine as potential agents and / or compounds to reduce ATF4 activity, and thus the weakness and atrophy in skeletal muscle aging. "